The sunrise over Begz ger where we stayed was majestic. It was very early Friday morning. 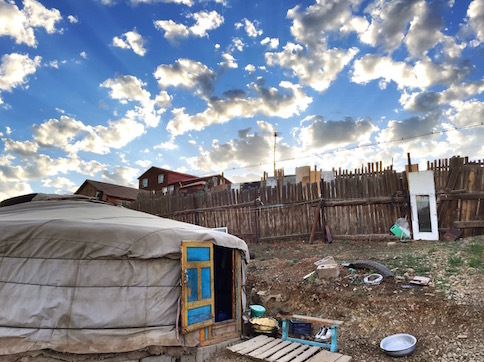 The sun came up at 4:55AM in the city of Ulaanbaator so I woke up very early to take photos of the myriad of white cotton candy cloud puffs that were scattered across the deep blue sky as the sun peaked over the hills. I was also watching our couchsurfing host Begz milking his 8 cows. In the background there were a valley with green pasture on the right and a sprawling urban center on the left. 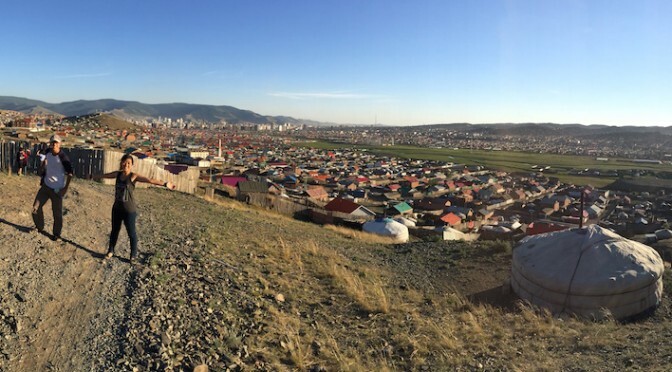 A beautiful sunrise view of Ulaanbaator from Begz’s home. 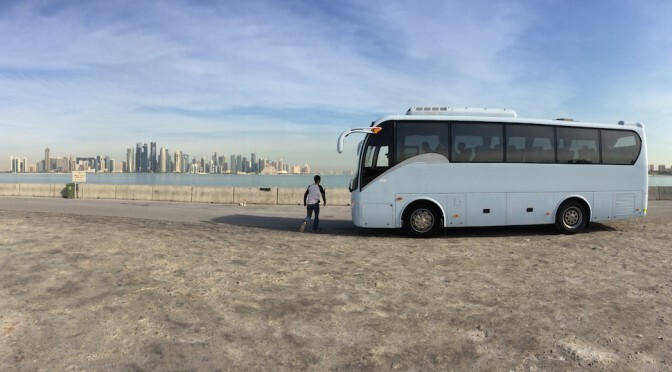 “Do you know what ‘Nomadic’ people mean?” Begz asked again. I kept nodding and admiring Begz, a person of small stature but with big heart. Not only was his words full of wisdom, the actions of his entire family of six during our 3 days 2 night stay taught us many life-long lessons during our first stop in Mongolia. We had a fun group photo after our meal of just salad. Begz’s family was the first couchsurfing home we have stayed but we have hosted many couchsurfers during the last four years. 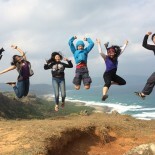 Couchsurfing.com is a website where people offer their home for free for travelers to stay. 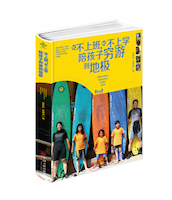 It is a way for travelers to get to know the locals and for locals to know people around the world. 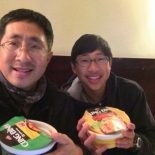 We tried to be friendly and generous to all our couchsurfing guests, but we were not prepared for Begz family’s hospitality! 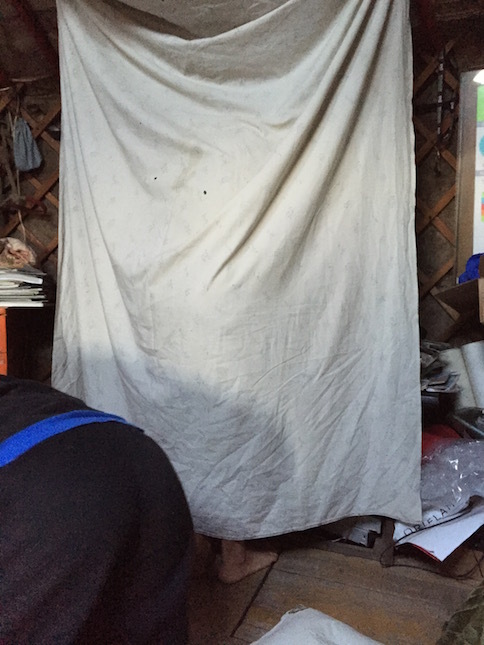 With detailed instruction, we arrived at Begz’s home after a short hike up the hill. 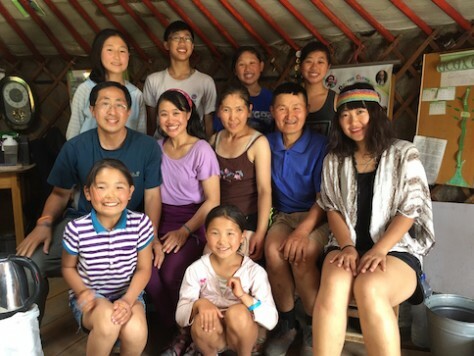 Begz’s family of six live in a simple ger at the outskirt of Ulaanbaator. They have 8 cows and 4 calves, which Begz milk twice a day to make yoghurt, selling the extra as income. Every morning the children herd the cows to nearby pasture or hill to graze and take them back home in the afternoon to be milked. 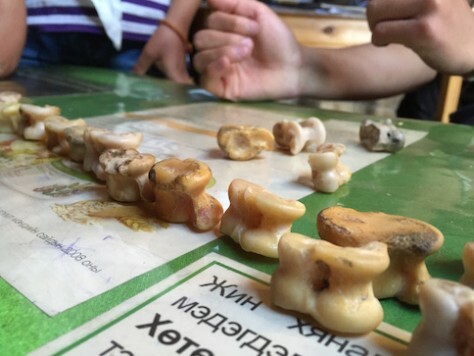 The Begz’s children taught us how to play games with ankle bones of sheep. Different shape represents different things. 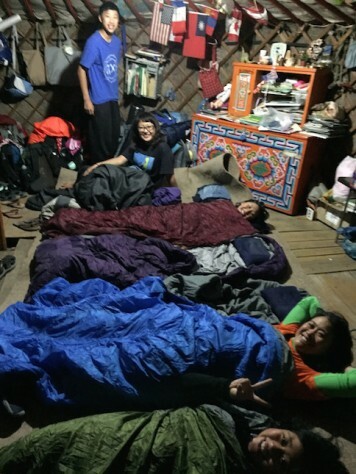 Their whole family sleeps, cooks, studies, and play inside their ger roughly 3-meter radius. 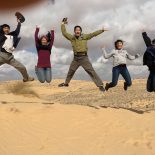 But they didn’t mind our entire family of five plus another single couchsurfer to live and sleep together with them in the same ger, a total of 11 of us. They shared their yoghurt, milk, tea, and other food with us and let us use and drink their precious water which they have to cart from afar. 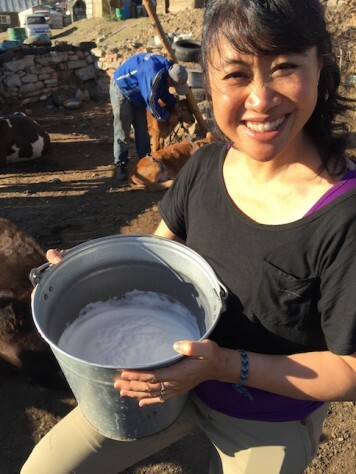 They let us trying milking the cows and each child danced and played Mongolian songs (plus some trendy Korean dances) to entertain us. All the above they give without asking anything in return. They eat and dress simply and enjoy simple games made out of bones of sheep. Because of their need, their third child is being helped through World Vision’s community development program. Begz taught each of us how to milk his cow. The trick is to be quick! Fresh squeezed milk still with cream on top. Begz began hosting couchsurfers in 2008. Seven years later, we are his 287th group! We estimated he has hosted around 800 people. Afterwards when we shared what we learned from our experience, Olivia immediately shared, “True hospitality!” We all unanimously agree. The Begz family gave out of their heart, not out of their extra. We slept on top of a sheep felt carpet together with Begz’s family on the floor of their ger. Since the ger is just one room, they use a cloth as the “changing room”. We went outside of the Begz’s ger to wash our dishes after eating the refreshing cold yoghurt made by Begz’s wife from the milk of their cow. But we were dumb-founded at the contraption that we saw. “Push up the white plug. Water come out,” Gamat laughed. Pushing up the white plug will release drips of water down the bottom opening. 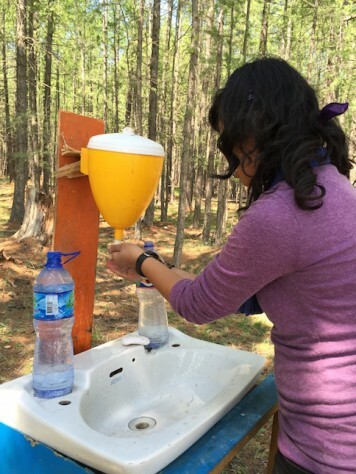 One fills the contraption by pouring water into the top opening. The strange contraption was like a container with an opening at the top to pour in water and a hole in the bottom for the water to come out. There is a white tube that allows water to flow out of the bottom whole when pushed up. This way by pushing gently, only few drips of water will come out. It is used to wash dishes, hands, face, and everything else. Although Begz’s family is right on the outskirt of the capital of Mongolia where 30% of the population lives, there is no tap water system in their community. Everyone has to go to a water station, similar to a gas station, to buy water for 1 Tugrik per liter. 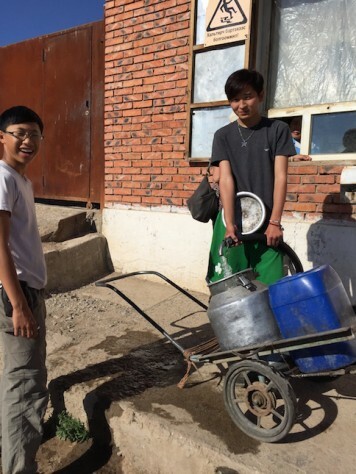 Fortunately they have a water cart but pushing the cart up and down the hill was still very hard work. Nathan tried but couldn’t pull the 120 liters up the slope by himself. At UB, many get water at the water station, similar to our gas station. Naturally, we became very conscious of how to reduce the use of water around the house. 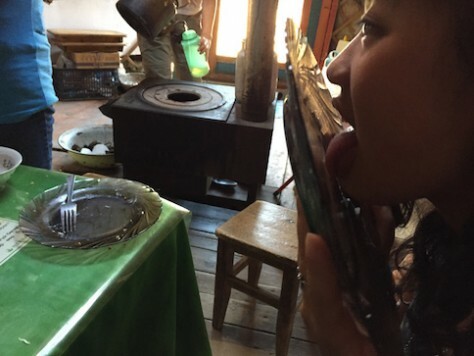 First, the Begz family licked all their bowls shining clean with their tongue, which according to Begz is also good for the digestive system just like the cows licking themselves and their young calves. Second, when washing each dish, we pour the dirty water from one dish to another dish, reusing it each time. Third, we carefully rinse the dish with few drips of water rubbing the dish clean with our fingers. Because we can see the change of the water in the contraption, we can know how much water was used. Joani who normally don’t eat cleaning even learned how to lick clean the bowls, better than most of us. Joani showed off how clean is her bowl after the meal. 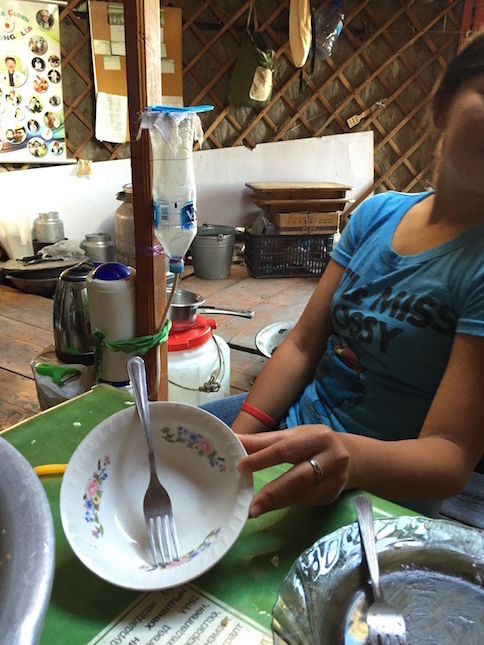 “I couldn’t believe we use so little water to wash all these dishes!” Joani said with a surprise. “Their family don’t use any soap for washing dishes either,” commented Nathan. 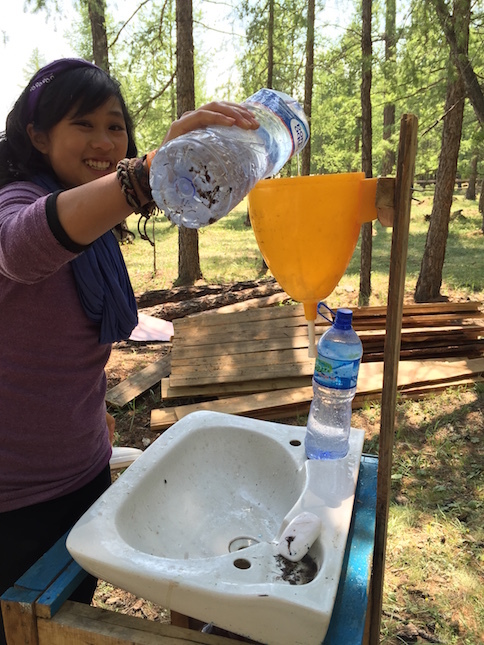 In Kunming, the children used water without thinking about the amount of water used. Here, they realized how precious is water for some families, the hard work it took to get the water, and seeing visibly the amount of water used for different activities. Here at Begz family, we learned the lesson of the preciousness of water. We tried not to laugh as we sheepishly peeked at Joani who was staring into her bowl of salad containing cabbage, carrot, and yoghurt in obvious great discomfort. Joani is known as the meat eater of our family so never had she had dinner with just a big bowl of salad and she was afraid to complain or not eat in front of the host. It was a lot of fun making our first salad together. This is Gamat with our first meal with just salad! 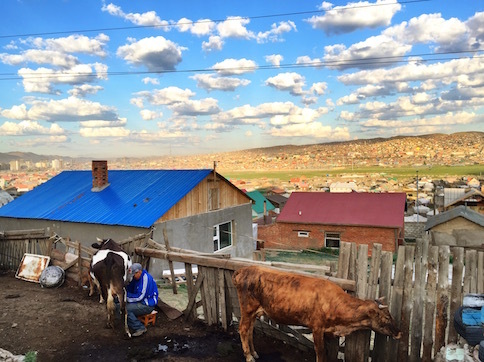 Mongolia is known as the country of meat eaters as the harsh weather makes growing vegetables difficult and their lifestyle of raising cattle and sheep means meat are plentiful. All there dishes are mostly meat and flour. In China, dumpling is mostly vegetables with some grounded pork. 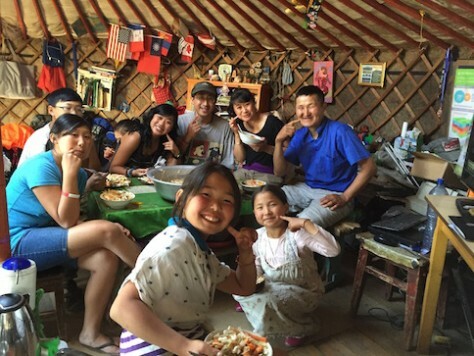 Here in Mongolia, dumplings are almost entirely of lamb meat. However, to our surprise, the Begz family eats almost no meat. Begz has been leading a community Health Club everyday for the last 3 years, where he advocates eating healthy fruit shake, tea, aloe drink, and vegetables. At the club, they measure the circumference of our neck, arms, legs, and waist to calculate body and visceral fat % and weight, with reducing these as the target and not the total weight. Naturally, for our meals at Begz’s home, it is also very healthy with mostly vegetables and yoghurt. 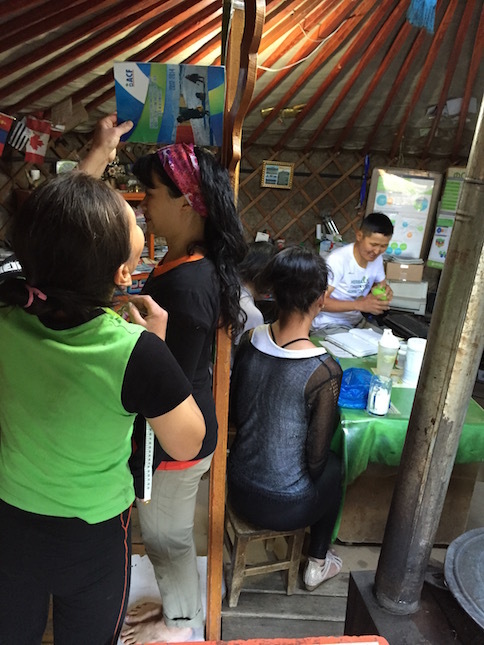 After 2 days, we each visibly felt we lost our weight and healthier but we got hungry quite quickly. 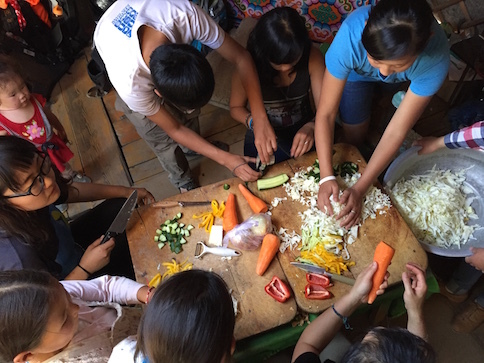 Every morning, Begz runs a community nutrition club where the club members eat and exercise together. 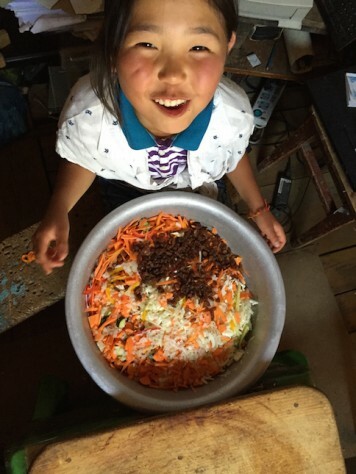 The children laughed that our grandmother would love making friend with Begz because our grandma is also very health conscious and always stock us fully with all sorts of vitamin. Before we left, we left goodbye messages, hugged, and took many photos for memories. 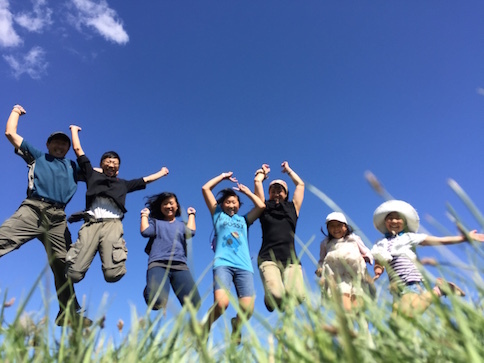 We felt like a close family only after 3 days. This is our new family portrait. 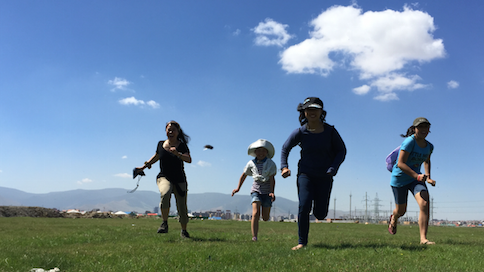 “This is so worth it!” the children all agreed after we left Ulaanbator for our next destination in Mongolia. 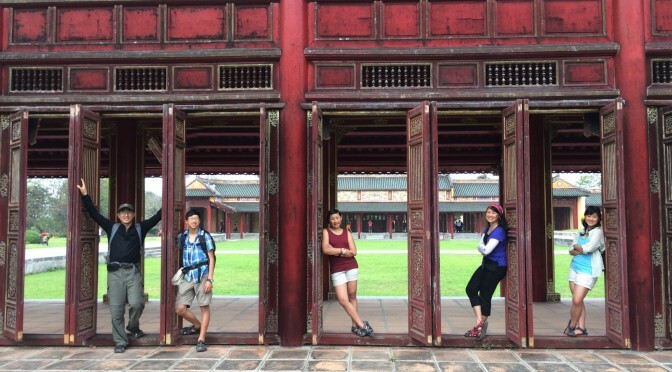 “I asked God to show me new experiences this trip. 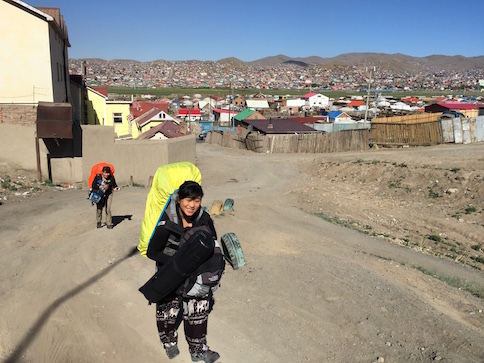 And I learned so much about doing chores, using water, and nutrition here.” Nathan shared during our meal at the bus station leaving Ulaanbaator. 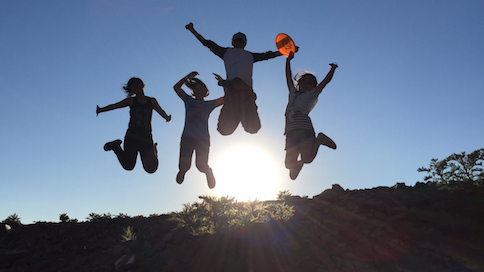 Unexpected lessons left us with surprise and thankfulness as we hugged each member of the family. We knew then that the Begz family will be our lifelong friends and will always have a special place in our Su Family Backpacking Adventures highlight. Right at the outskirt of the capital is a pasture next to the river where we brought the cows to graze. We enjoyed the beautiful sunset on the top of the hill near Begz’s home. The children of Begz brought us to the pasture for a fun run. 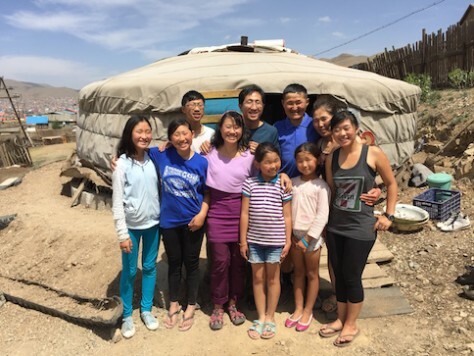 I’m proud of your living and heartily feeling with my Mongolian family and hard working to tell your feeling to your friends by this blog post, so can I continue … have you heard of this Mongolian proverb? “one seeing is really better than thousands listening”, thank you again for life long friends. A perfect post on this incredible family! Thanks for reminding us! Could not have written better words about Begz, Soyombo and their amazing children. This was our amazing experience 6 years ago already and I am glad they keep changing the world one person at a time.